The book of Judges is a curious one, containing some really questionable content, especially toward the end of the book. The judges it highlights are a colorful bunch, some exhibiting quite dubious behavior. It boils down to leadership and a lack of leadership. Judges gives us some leadership lessons. In Judges, the people are a motley collection, and I cringe over some of their attitudes and actions. Yet despite the shortcomings of many, they do lead people to freedom and to a refocus of their attention on God. This cycle of disobedience (rejecting God), oppression (punishment), liberation (rescue), and returning to God (obedience) is a reoccurring theme in the book of Judges. Another reoccurring theme is the phrase, “In those days Israel had no king; everyone did as they saw fit” (Judges 21:25). In fact, this is the concluding sentence of the book of Judges, a fitting end to a collection of stories, some of which I find quite disconcerting. Today we also lack godly leadership. And without good leaders people pretty much do as they see fit. So, true to our nature, most everyone is doing whatever he or she wants. We see this with the in vogue religion of today, where people make up their own religious beliefs, their own set of rules – or lack thereof. We are so in need of good leaders to guide us. Yet we are all leaders, be it in society, the political arena, education, at work, in our home, and even of ourselves – we are especially leaders of ourselves. Doing as we see fit can lead us down a wrong path. 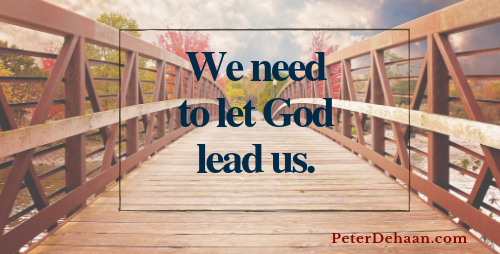 Instead, we need to let God lead us and then do what he wants.